Written by Tania Braukämper • 09 Dec 2008 . I have to admit that we here at Fashionising.com do tend to get a lot of stuff to review, but its not every day that we receive something that is timed so well. After going out on a Saturday night to a fashion show, then a pretty wild after-party, we were all feeling well and truly partied out the next day. 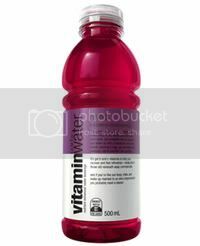 To our good fortune, we’d been sent over some ‘Revive’ Vitamin Water by Glaceau that week (seriously – what a god send!) This drink is formulated for recovery with water soluble vitamins to help the body recover from a big night. And though the marketing is geared towards being a hangover cure, I’ve also been drinking it after a gym workout, or even just an exhausting day. They have other flavours too – dragonfruit, acai-blueberry-pomegranate and kiwi-strawberry… each with a different formula of vitamins and minerals. To top it all off, they actually do taste really good. Visit www.glaceauvitaminwater.com.au for more information.